Statue base of Hadrian set in the Theatre of Dionysus on the south slope of the Acropolis, the bilingual epigraphic inscription commemorates Hadrian’s election as archon of Athens in 112/3 AD by the Athenians. The lengthy inscription provides our most important record of Hadrian’s career up to then. (ILS 308/CIL III 550). 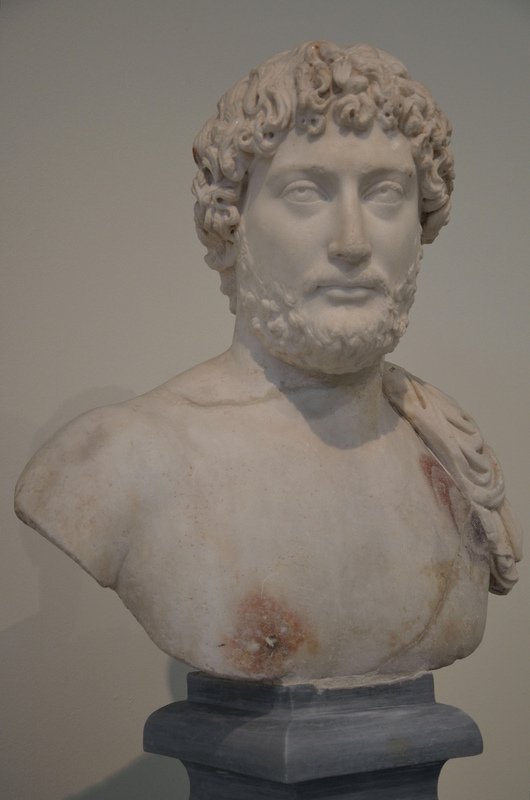 As emperor, Hadrian returned to Greece in early autumn AD 124, in time to be initiated into the Eleusinian mysteries and again in late summer 128 together with Antinous. In March of 125, he presided as agonothetes (superintendent of the sacred games) at the Greater Dionysia, the ancient dramatic festival held in Athens in honour of Dionysus. It is said that twelve statues of Hadrian were set up in the Theatre of Dionysus by the twelve tribes of Athens, one statue by each tribe. A new era began upon Hadrian’s first visit as emperor and a thirteenth tribe called “Hadrianis” was added. The inscriptions on the bases of four of these statues have been found in the theatre. 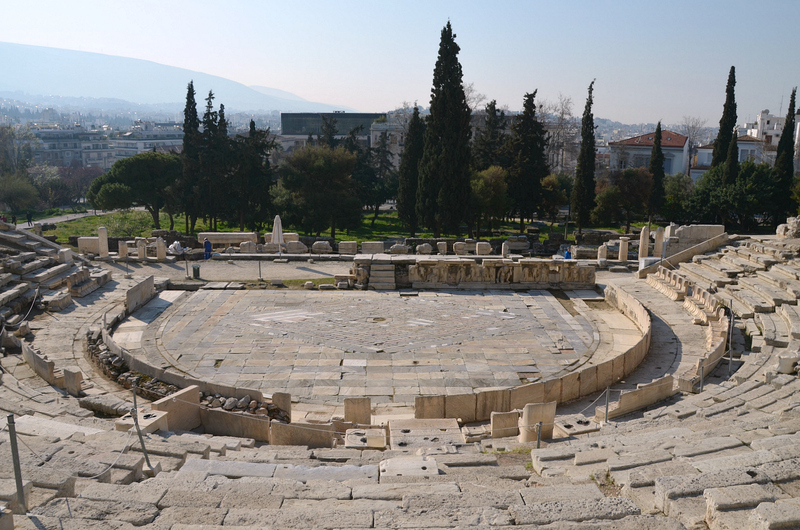 The theatre of Dionysos Eleuthereus on the south slope of the Acropolis of Athens was first built in the 6th century BC. 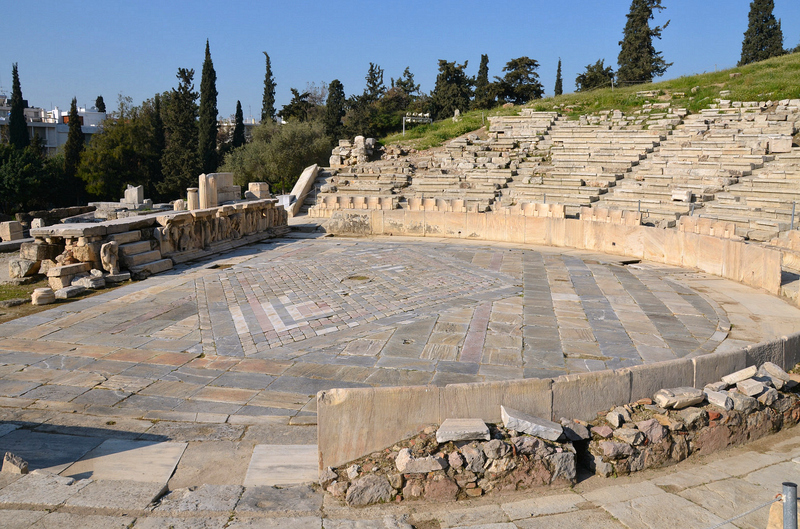 It is the oldest Greek theatre but was modified and expanded over the centuries. The invasion of the Romans under Sulla in 86 BC caused severe damage to the building. Restoration work was subsequently carried out in the 1st century AD during the reign of Emperor Nero when a new two-storey skene was created in the place of the old one. However, according to A. Karivieri in Greek Romans and Roman Greeks, it was Hadrian who built the monumental scaenae frons with reliefs depicting the life of Dionysus we see today. A. Karivieri gives a summary of Hadrian’s benefactions to Athens as well as the emperor’s association with Zeus, Theseus, and in particular Dionysus through the iconographic program of the scaenae frons of the Theatre of Dionysus. 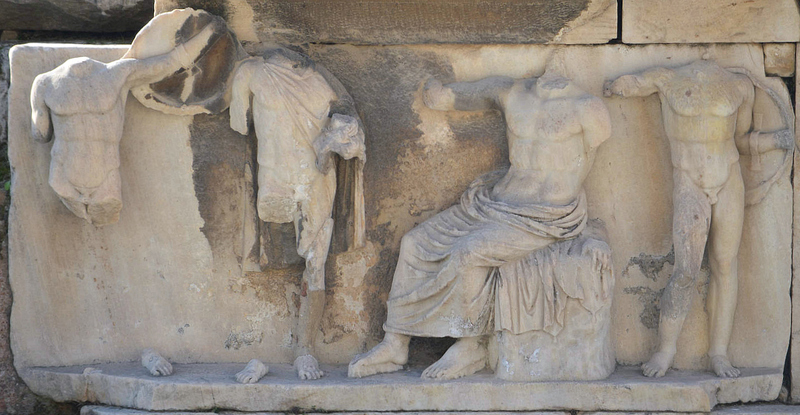 Hadrian assimilated himself with Dionysus in these reliefs. He was the new Dionysus (neos Dionysos), the new founder of Athens. Hadrianic reliefs from the stage front (scaenae frons) of the Theatre of Dionysus on the South Slope of the Acropolis. 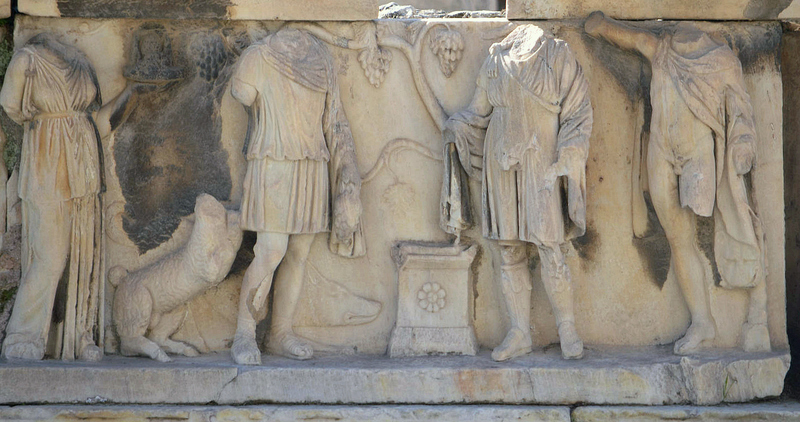 Detail of the Hadrianic reliefs from the stage front (scaenae frons) of the Theatre of Dionysus depicting Dionysus giving the gift of vine and wine to Icarius as a reward for Icarius’ generous hospitality. Detail of the Hadrianic reliefs from the stage front (scaenae frons) of the Theatre of Dionysus depicting the enthronement of Dionysus. 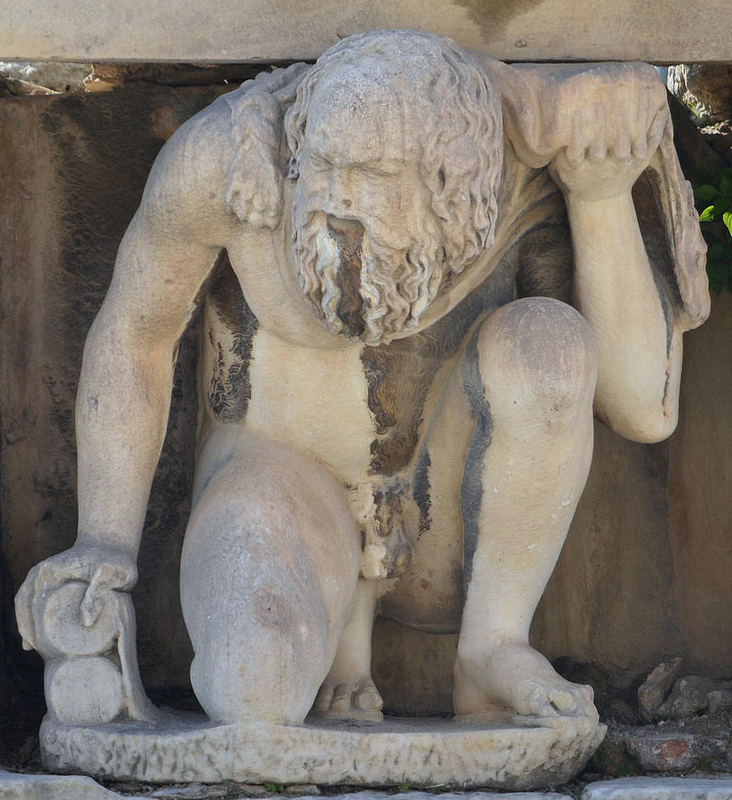 Detail of the Hadrianic reliefs from the stage front (scaenae frons) of the Theatre of Dionysus depicting a crouching figure of Silenus in the attitude of Atlas. Detail of the Hadrianic reliefs from the stage front (scaenae frons) of the Theatre of Dionysus depicting the Birth of Dionysus; Zeus is shown seated while Hermes stands before him holding the new-born infant in his arms. Many of Hadrian’s benefactions to Athens have been dated to his 3rd visit in AD 131/2. Hadrian added a new quarter to the city of Athens; it was located to the east of the old city. 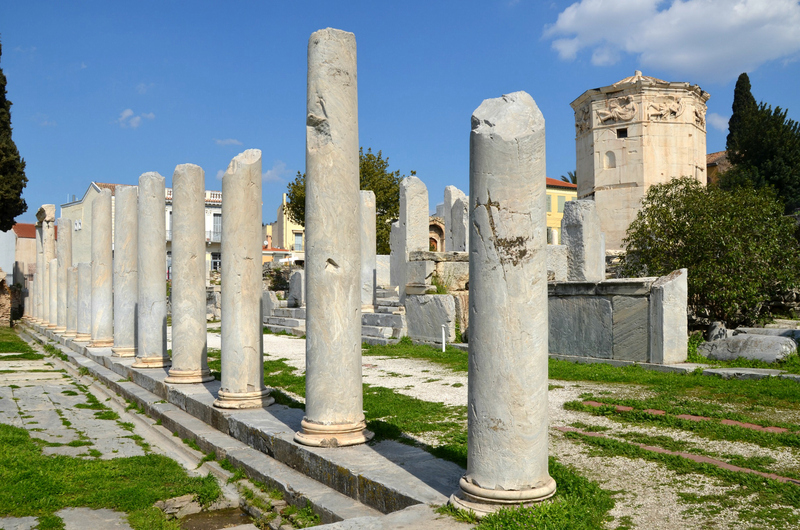 Ancient authors, like the Greek traveller Pausanias, give a first-hand account of Hadrian’s benefactions to Athens. 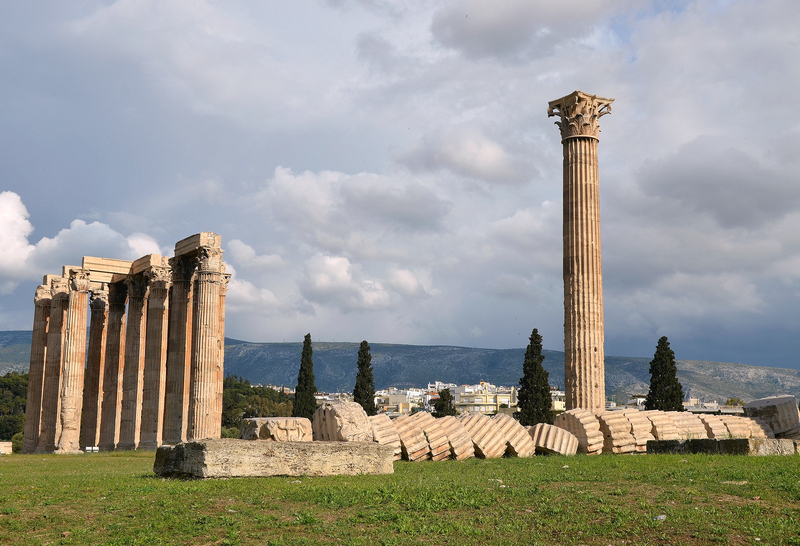 Among his most ambitious projects was the completion of the vast Temple of Olympian Zeus, a project begun over six hundred years earlier by the Athenian tyrant Peisistratos but soon abandoned when the tyranny was overthrown. Only the platform and some elements of the columns had been completed by this point, and the temple remained in this state for 336 years. It was not until 174 BC that the Seleucid king Antiochus IV Epiphanes revived the project with new designs by the Roman architect Cosssutius. 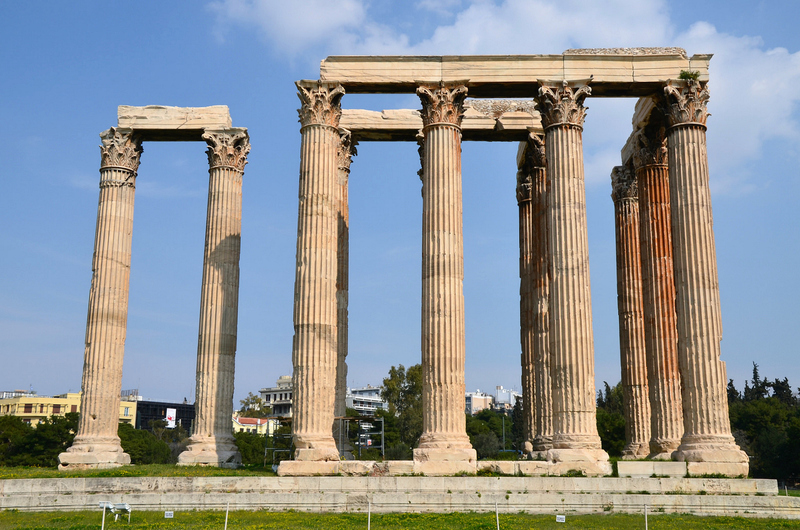 Overview of the Temple of Olympian Zeus. The new temple followed its predecessor’s plan but used the Corinthian order and Pentelic marble instead of poros stone. However, the project ground to a halt again in 164 BC with the death of Antiochus. The temple was still only half-finished by this stage. Serious damage was inflicted on the temple by Sulla’s sack of Athens in 86 BC. While looting the city, Sulla seized some of the incomplete columns and transported them back to Rome, where they were re-used in the Temple of Jupiter on the Capitoline Hill. Further work was carried out during Augustus’ reign, but it was not until the accession of Hadrian in the 2nd century AD that the project was finally completed about 638 years after it had begun. 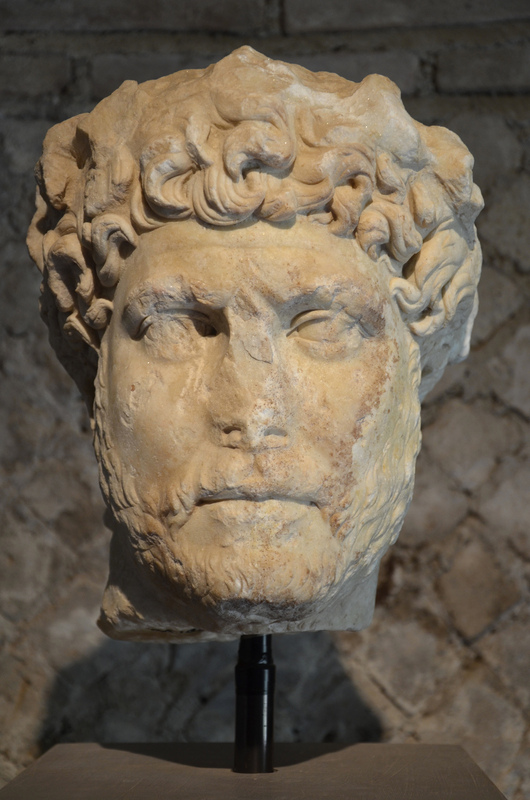 Hadrian attended its dedication ceremony in the winter of AD 131. 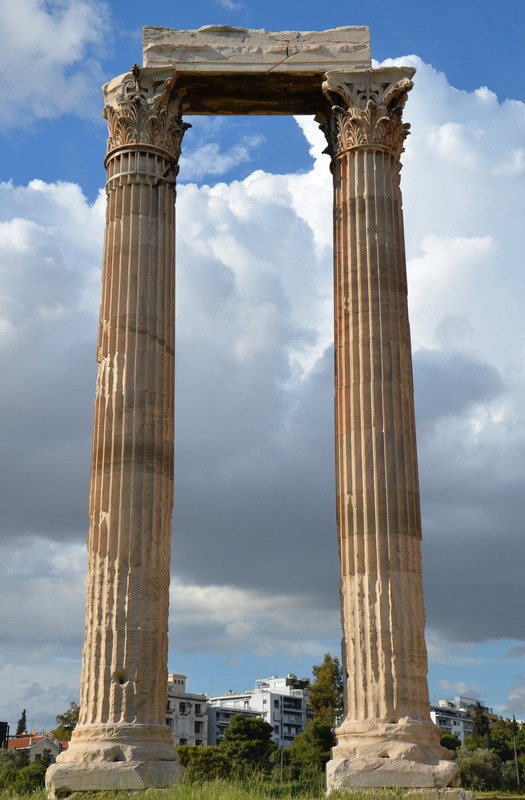 Today, only fifteen of the 104 massive 17.25 meters high columns (57 ft) remain standing. A sixteenth column was blown over by a fierce windstorm in 1852 and was left where it fell. According to Pausanias the cella housed a colossal chryselephantine (ivory and gold) statue of Zeus which “[exceeded] all other statues in size except the Colossi of Rhodes and Rome” (1.18.6). Pausanias also tells about a colossal statue of Hadrian erected by the Athenians behind the temple. 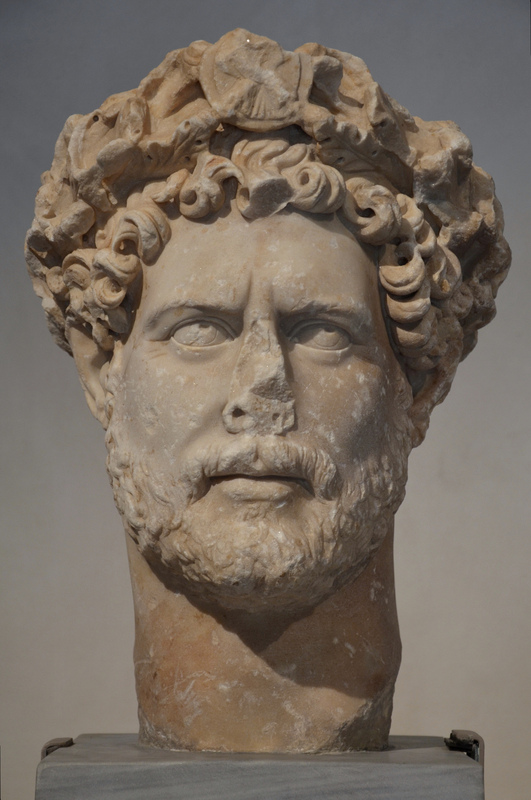 Hadrian was therefore associated with Zeus and received the epithet “Olympios” (Ἁδριανὸν Ὀλύμπιον). 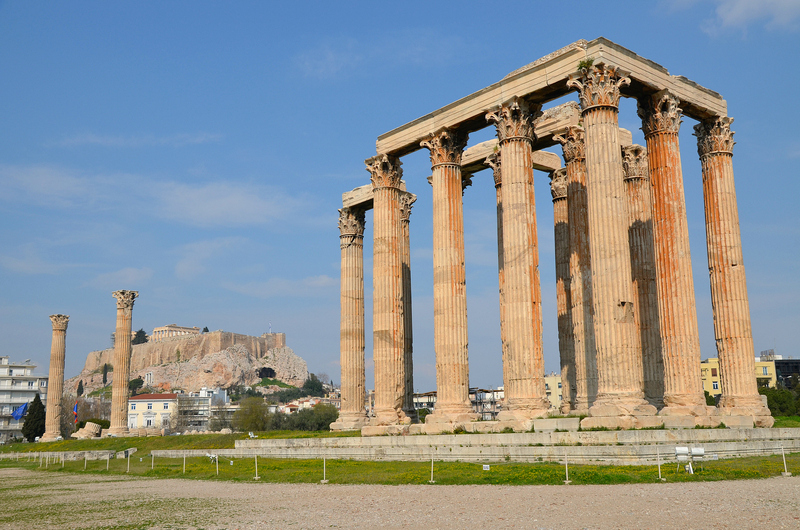 While the temple was originally dedicated to Zeus, in effect it became a centre for the imperial cult. Zeus and Hadrian who were worshipped here as symbomoi theoi (sharing the same altar) and the enclosure was adorned by a large number of statues and dedications. 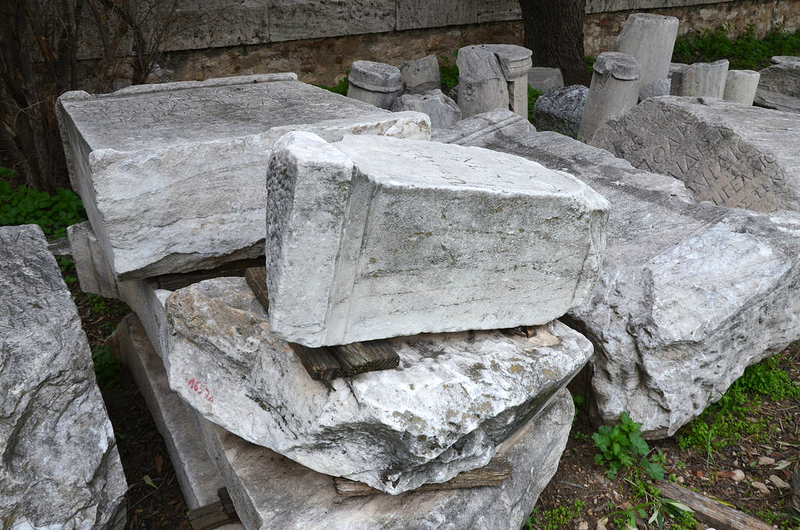 More than 50 bases for Hadrian have been found in Athens, 30 of these in the Olympieion alone. Statue base preserved in the Olympieion (Temple of Olympian Zeus) dedicated to Hadrian in 131/32 AD during the inauguration of the Temple (IG II² 3307). 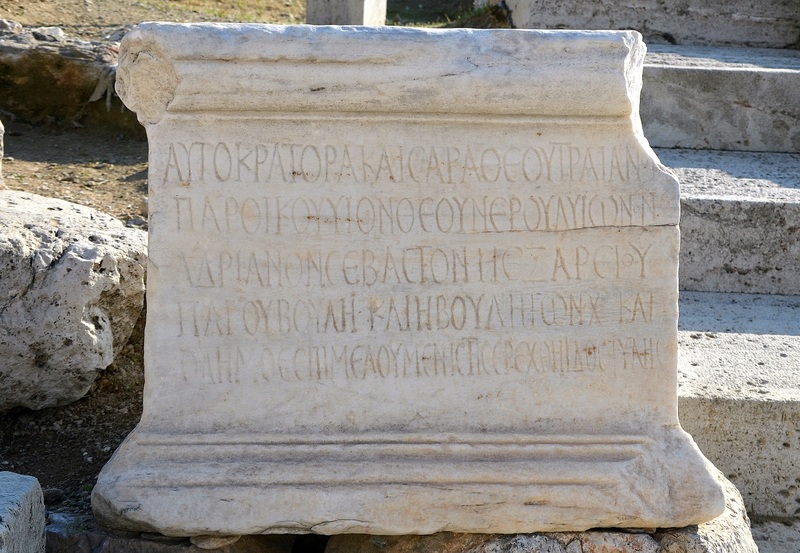 In addition to statue pedestals, small altars bearing dedicatory inscriptions to Hadrian were also set up in the Olympieion. 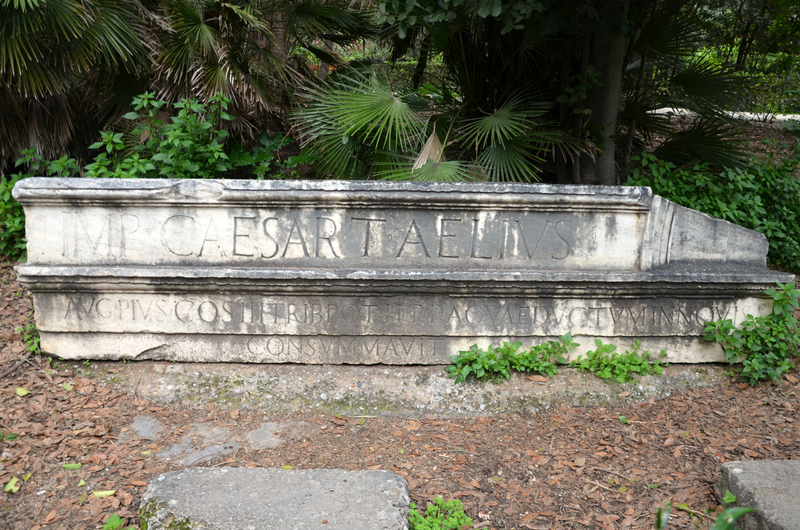 These altars took different forms but all had the same brief dedicatory inscription: “To the Saviour and Founder Emperor Hadrian, the Olympian”. 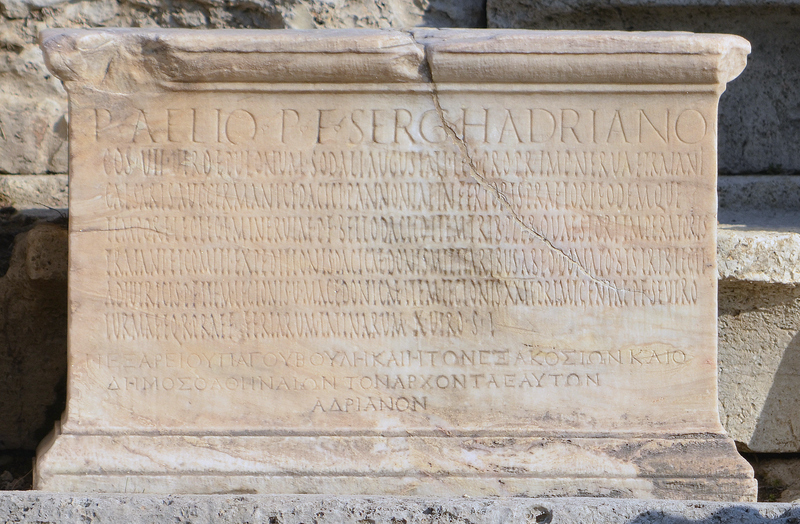 This dedication was orchestrated in the year AD 131/2 when Hadrian inaugurated the Olympieion, founded the Panhellenion and established the Panhellenia Games. To the north of the Olympeion are preserved the ruins of a large bath complex built at the time of Hadrian, between AD 124 and 131, with superb mosaic floors, coloured marble slabs (opus sectile), and marble revetment on the walls. In the north wing were the entrance, a nymphaeum with a small fountain, waiting rooms, changing rooms, while the bathing facilities stood in the south wing. The Hadrianic Bathhouse decorated with opus sectile. 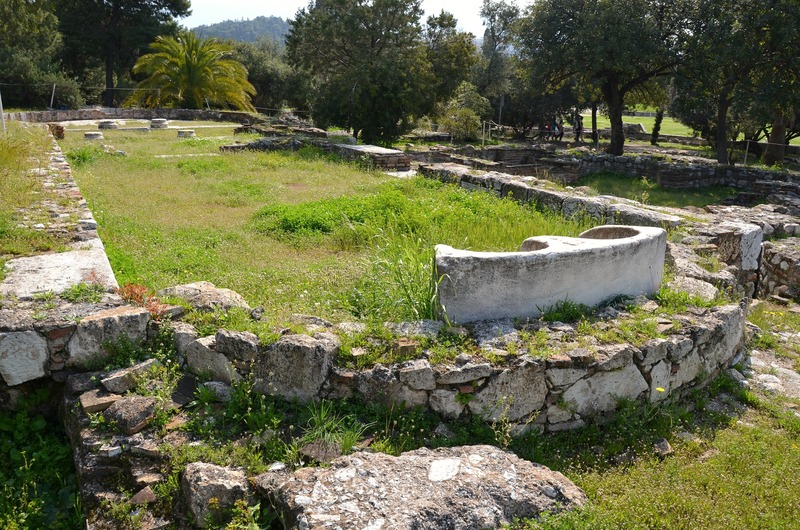 The bathhouse was used until at least the end of the 7th century AD, as is attested by the coins found on its floor with the octagonal room probably used as a baptistery in association with the basilica that was built nearby. Pausanias lists more Hadrianic buildings near the Olympieion; a Temple of Kronos and Rhea and a ground sacred to Olympian Earth, Gaia (1.18.7). 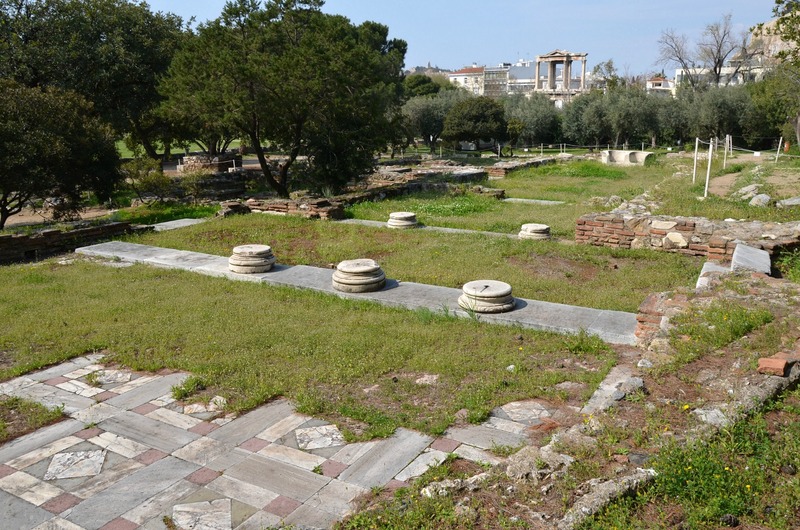 Also mentioned by Pausanias are other Hadrianic constructions in Athens; a gymnasium with one hundred columns of Libyan marble (from Simitthu in Tunisia), a Temple of Hera Panhellenia and Zeus Panhellenios, a new library and a Pantheon, a “sanctuary common to all the gods”. The latter has been partially excavated on Odos Adrianou, some fifty meters east of the Library and the Roman Agora. However, it is also believed to be the Panhellenion, a meeting place of the deputies of city-states, work of Hadrian as well. One of the most impressive and luxurious buildings built by Hadrian is the so-called Library of Hadrian. Pausanias describes it as “a hundred columns of Phrygian marble, with walls built just like the columns, and pavilions with gilded roof work and alabaster, decorated with statues and paintings. Books are kept in them” (1.18.9). The west facade of the Library of Hadrian with columns of green Karystos marble. The library of Hadrian was seriously damaged during the sack of Athens in AD 267 by the Germanic Heruli tribe and was subsequently incorporated into the Late Roman fortification wall (post-Herulian city-wall). Re-erected Corinthian columns of the propylon of Pentelic marble. In the 5th century, a church was built in the centre of the courtyard. During the Ottoman occupation it became the seat of the Voevode (Governor) and in 1835 it was incorporated into the barracks built by King Otho. The Gate of Athena Archegetis, the main entrance to the Roman Market. A decree of Hadrian regulating the sale of olive oil, an important branch of Attic commerce, is engraved on the north jamb of the doorway of the Gate of Athena Archegetis which served as the main entrance to the Roman Market. The decree states that oil producers shall deliver 1/3 of their production in taxes. Its aim was also to reassure that the city would always have a sufficient amount of olive oil for sale. 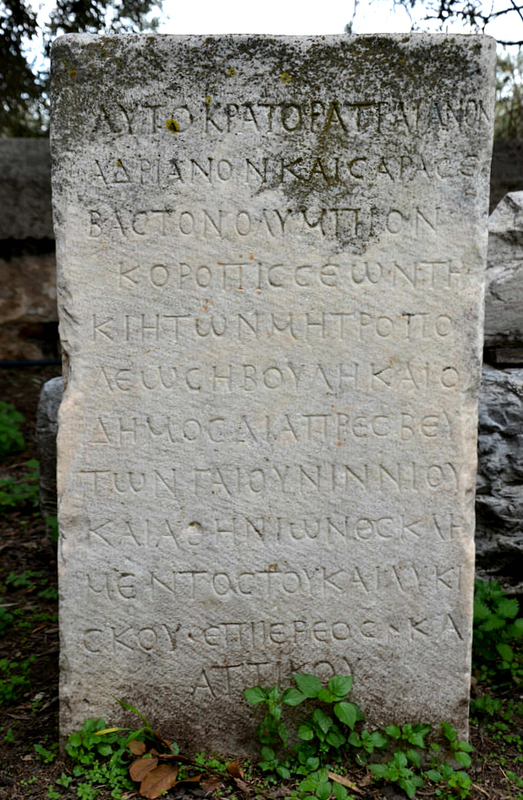 The top line reads KE NO ΘE AΔPIANOY: “chief points from the law-giving of Hadrian”. A monumental gateway resembling – in some respects – a Roman triumphal arch was erected in AD 131 to honour Hadrian for his many benefactions to the city, on the occasion of the dedication of the Temple of Olympian Zeus. 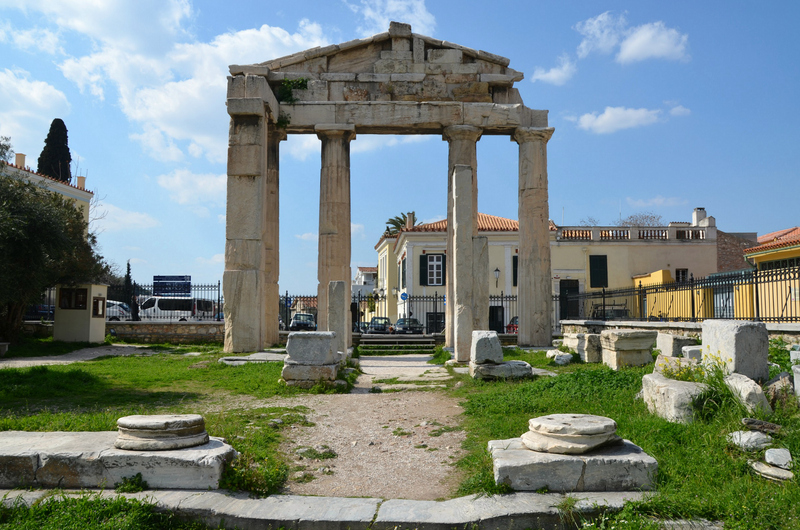 It is not certain who commissioned the arch, although it is probable that the citizens of Athens or another Greek group were responsible for its construction and design. There were two inscriptions carved on the architrave, facing in opposite directions, naming both Theseus and Hadrian as founders of Athens. The arch was placed strategically so that people coming from the Agora went through the arch and could read the text on the west and the text on the east when returning from the Olympieion. Some scholars have traditionally interpreted the inscriptions as meaning that the arch stood at the boundaries of “old Athens” (to the west) and “new Athens” or “Hadrianoupolis” (to the southeast). Other scholars have proposed that the inscriptions, rather than dividing Athens into an old city of Theseus and a new city of Hadrian (Hadrianopolis), claim the entire city as a re-foundation by the emperor, suggesting that the inscription should be read “This is Athens the former city of Theseus”. 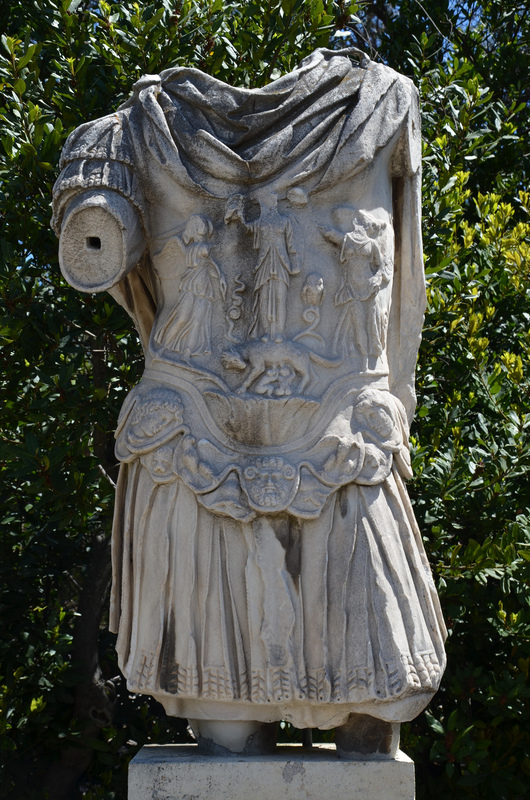 In the Greek Agora, the civic heart of Athens stands a headless statue of Hadrian, originally placed on a rectangular pedestal in front of the Hadrianic Nymphaeum. A striking scene is depicted on the cuirass; Athena standing on the back of the she-wolf suckling Romulus and Remus, an allegory for Hadrian’s vision of the Athenian cultural heritage nourished by Roman rule. Athena is flanked by two winged Victories emphasizing the importance of Athens. This statue shows Hadrian’s relation to both Athens and Rome. In addition, around 30 altars have been reported as found near the Agora and the Temple of Hephaestus/Theseion. To respond to the city’s fundamental need for water, Hadrian commissioned the building of a new aqueduct. Its construction started in AD 125 and was completed fifteen years later in 140, during the reign of Antoninus Pius. The aqueduct consisted primarily of an underground tunnel at a length of over twenty-five kilometres. It was designed not only to transfer water towards the city but also to collect it through a number of smaller catchment works along the way. 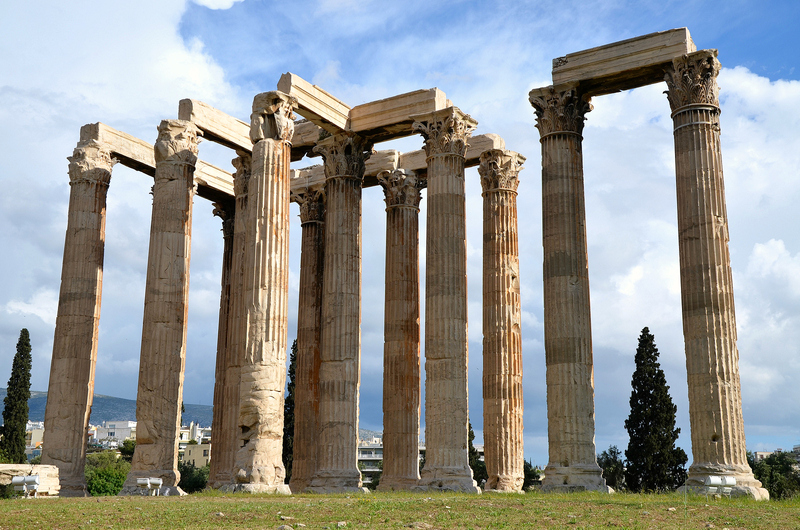 It continued to supply Athens with water until the twentieth century. Archaeological remains may still be found, notably two water bridges in Nea Ionia, underground shafts at the Olympic Village and the water reservoir located on Lycabettus Hill in the city of Athens. A dedicatory inscription on the architrave mentioned that Antoninus Pius completed and inaugurated the aqueduct. The left side of the inscribed architrave is kept today in the National Garden. 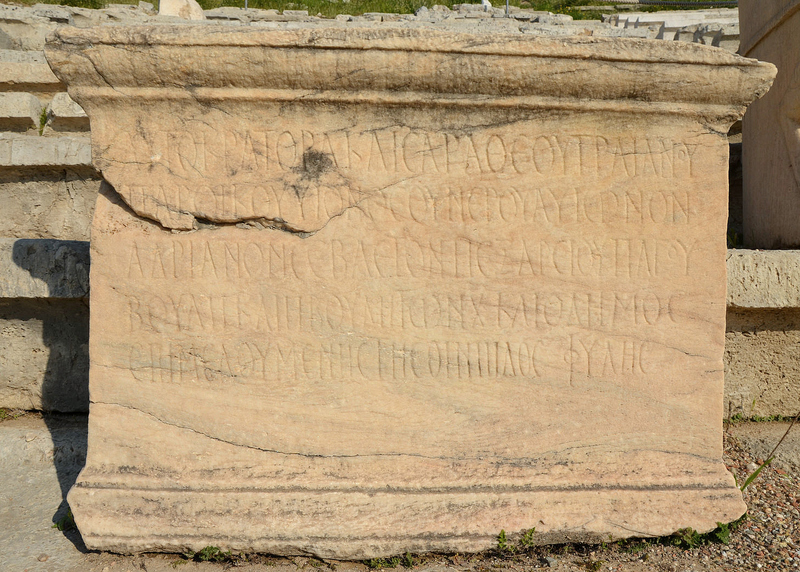 Fragment of a lintel with dedicatory inscription originating from Hadrian’s reservoir on Lycabettus hill. It can be found in the National Garden (CIL III 549). ″The emperor Caesar Titus Aelius Hadrianus Antonius Augustus Pius, holding consular power for the third time, holding tribunition power for the second time, father of the state, completed and dedicated the aqueduct which had been begun by his father the divine Hadrian in New Athens″. Translation by S. Leigh (Leigh 1998, 107). Benjamin, A. S. 1963. The Altars of Hadrian in Athens and Hadrian’s Panhellenic Program. Hesperia 32 (1): 57-86. Previous postFelix dies natalis, Marce Aureli! Very nice. I’ve seen most things in Athens, but this fills in some details I missed. Hi Carole, Thanks for these superb photo’s. which bring out more detail of what I have many times seen. How long are you in Athens, do you think you will have time to come to Crete ? If so let me know I live Agios Nikolaos area. Maybe we could meet. Hi Rita, I am already back home from Athens. I am planning to come back to Crete next year. I visited Agios Nikolaos in 2004 so I know the area where you live. I think I might come next Easter. I will keep you updated. Also, notice the Tower of the Winds in the background of the picture “The colonnade on the east side of the courtyard of the Roman Agora, Athens” which is rather special. Thanks for your detailed article! I travelled to Athens (and Europe) for the first time in my life this June. Here is a poem that I wrote today about my experience at Hadrian’s Library (and the Roman Agora). I’m new to Word Press, and will post all my 2017 travel articles (about England, France and Greece) once I finish writing. To wander among the shelves of books invaluable. Its serenity convinces me to put my worries aside. And here is Julius Caesar’s Commentaries on the Gallic War. In this astronomical book by Ptolemy, coherent points are raised. Scrolls of the Torah lying not far as I’m aware. And civil contracts in cuneiform were inscribed on mud and rocks. This would be the second best place that I want to frequent. That emboldens our belief and sanctifies what we know. By St. John the Theologian in Patmos, is the document I am after. Treading the colourful marbles that pave the floor. Unlike their hapless fellows in Alexandria, burnt by anger and crime? Which will be today’s lecture topic at the Northeast Auditorium. And then hear the latest court cases at the Basilica. I visited the National Garden in February of 2018. When I returned home I was intrigued by the inscription on the Fragment from the lintel from Hadrians Reservoir that I had found amongst my photographs. I found this site when researching its history. Many Thanks!